This question is exceedingly simple to answer, yet easily eighty percent of churches choose the wrong answer. The reality is that most churches try to place the house mixing desk (console) in a location that hides the equipment as much as possible. Their solution is driven by aesthetics, mostly because that is what they understand. My guess is that they havent asked their sound team volunteers, the ones who will be actually operating the thing, where they would prefer to have it located. If the house mixing console is not positioned so that the operator can clearly hear both the sound system and the congregation in their own setting, then his/her mix will never be more than an interpretive mix at best. For example, the sound system may be too loud on the main floor and your engineer wont know it. Imagine the plight of the sound operator trying to mix from this vantage point - at the back of the third floor balcony. The pastor was convinced that he would have no problem mixing from this room, that if he had problems hearing he could just step out of the room for a moment. Poor guy. One thing youll find when the sound system gets too loud is that the congregation starts to lose a sense of corporate worship. That sense of corporate worship is one powerful difference that makes music in your church unique from other types of live music, and it brings a tremendous sense of life to the worship experience. Running the sound system too loud robs the congregation of their right to that experience. No amount of running down from the balcony to hear what it sounds like on the main floor will ever make up for simply placing the console where it should be in the first place. If placing the house mix position on the main floor is unlikely, what are your options? I cant make a blanket statement that the console should never be in the balcony because on exceedingly rare occasions it does work. 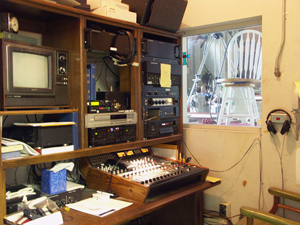 If youre forced into putting the house console in the balcony, you may be able to improve the situation by adding a dedicated house loudspeaker out in front and slightly above the engineers head that is delayed, equalized and level-matched to represent a listeners seat on the main floor of the sanctuary. The engineer wont hear the congregation, but will hear the mix okay. Another point to consider is to not place the console exactly in the center of the room. Remember that as the sound from your speaker system interacts with the acoustics of your sanctuary, there will be points in the room where the sound energy cancels. Try setting up a sine wave oscillator at, for example, 100 Hz, feed it over the sound system and then walk around the room listening for areas in which the sound cancels. It depends on the arrangement of your auditorium as well as the location of your main speakers, but since most church sanctuaries are fairly symmetrical, its entirely possible that youll have a significant cancellation in the center of the room. At low frequencies this null point could be quite wide! Therefore, it is entirely possible that a house desk placed at the center of the balcony, for example, would miss the low frequencies. Given that situation, a beginning engineers natural reaction would be to push the bass by adding more low frequency EQ than is needed, and/or by mixing the bass guitar and possibly other instruments louder than is needed. The only way to know if the low end is right is to walk away from the sound booth and listen in other areas of the room. While the engineer is away from the console, the mix could easily suffer. Worse yet, they could miss mic cues entirely if they chose the wrong moment to walk around and check their mix. Thats no fun for the worship team, for the congregation, and its especially no fun for the house engineer. 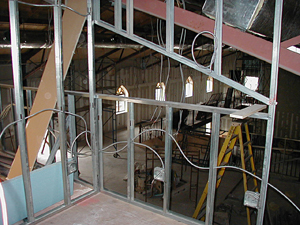 Another popular choice of churches is to place the console within an opening in the back wall of the sanctuary, and this solution generally forces a serious handicap on the engineer. The integrity of the sound heard inside that cavity can vary as much as 10 dB to 20 dB both in high frequency response and in overall level as compared with that of a prime seating location on the main floor. And since the opening is, in effect, a room of its own, it can also present its own acoustic imprint on the sound. In a setting like this, it is highly unlikely that the sound heard by the engineer is anywhere close to that heard by the congregation. Mixing in that environment is like trying to drive down the highway with your windshield frosted over. Here's (yet another) sealed sound booth at a church. Imagine yourself sitting in the hot seat. If you squint just right, you may be able to look through the cameraman's legs and chair to almost see some people on the platform. Who thought this would be a good idea? Please never ever put the house mix position in a room behind a glass window, or in a closet somewhere! Ive seen some awful mixing locations, but one of the worst was in a church in Singapore. The engineer was totally enclosed in a curtained room with dark glass walls. He had a tiny window, roughly eight inches high by twelve inches wide, that he could open to hear what was going on in the sanctuary. As is common in this type of booth, he had a microphone suspended out in the sanctuary that fed a pair of speakers so he could hear a representation of the sound out there. Also, he couldnt actually see the stage clearly from this location, so he had a remote controlled camera positioned on a column up high and in front of the stage that fed a small video monitor sitting over the house desk. I was glad that I was there to teach, not mix. Can the sound operator visually see down the throat of a high frequency horn aimed at that location? Can the sound operator clearly observe all that is happening on stage? Is the sound operator physically close enough to the main body of the congregation to share in their worship experience? Is the area above or to the sides of the location free of all acoustical obstructions within 10 feet? Is the frequency response and sound pressure level at the house mix position within ±3 dB of the frequency response and SPL measured at a prime location in the main seating section?